In recent weeks, you may have noticed the old ‘Newburn Bakehouse’ from Warbutons have a little sticker on to say that it’s changing its name to Warbutons Gluten Free. The range still has the same recipe, just shiny new packaging! I have to admit, I love this new branding. It’s minimal, it stands out and in my opinion, it fits in with the Warbutons brand more than Newburn Bakehouse did. With bold black and orange branding now, it’s super eye catching and I definitely think it will be easier for people to find in the Supermarket. Newburn Bakehouse was a bit of a mouthful to say in the past, and at least when you say “Warbutons gluten free” it’s easier to remember. Warbutons bread has always been a staple in my family’s house, not to mention the ONLY bread my family buy. So it’s nice to say I can enjoy Warbutons bread again (even if it’s gluten free and not the loaves in the blue wax paper that I used to know and love pre-coeliac diagnosis). A good thing about the gluten & milk free products is that they are all suitable for freezing, and do freeze very well. The range still consists of the same popular products that you can check out on their website here. You can also find them in the Free From aisle of most supermarkets. All of them are gluten, wheat and milk free and suitable for vegetarians. I was kind enough to have been sent a sample box containing some of their products to try, so let’s take a look at them and what I thought of them. I also have a quick and easy fake-away recipe along the way too, so check it out. The tiger loaf is from their artisan range, and since the demise of Udis, is the only gluten free tiger bloomer that I have found. On first impression, this smells absolutley gorgeous, and feels so soft to touch. It makes the perfect slice for a club sandwich, companion for soup, or just great toast! I am a big fan of their brown farmhouse loaf and the white loaf too, which is very suprising as I don’t tend to enjoy gluten free white bread that much. My mum always used to buy the white loaf for me, so I was looking forward to trying this out. This is loaded with poppy, linseed, millet and sunflower seeds making it high in fibre, something I struggle to get enough of in my diet. I received the 300g mini-loaf which is perfect if you need to BYOB to somewhere… We’ve all been there. And, it’s RRP is £1.50. It makes great sandwiches, and because the slices are low in saturated fat, with the right filling you can make a healthier choice. You can also make these into breadcrumbs and create your own breaded chicken or fish. A nice alternative to those takeaways you love and miss. It’s perfect accompanied with some tartare sauce. In an oven reheated to 120*c put the slices of bread on a baking tray for 30 minutes. While the bread is toasting in the oven, slice the cod fillets into bite size pieces. Once the bread is crispy, turn the oven up to 180*c, oil a baking tray. Coat the fish bites thoroughly in the flour, and then dip in the beaten egg. Dip the fish bites in the breadcrumbs and then transfer to the oiled baking tray. Bake for around 18 minutes, or until the fish starts to flake. Serve with tartare sauce, and enjoy! Now I absolutely love the protein wraps, I always have done. I try to get more protein in my diet, and I don’t really eat much meat, so this is the perfect balance with 11g of protein in each wrap. These wraps have such a lovely flavour and they have chia seeds and linseeds in amongst their ingredients, once again adding that fibre to your diet. They are great to use as a pizza base, filled with fajita vegetables, or just as a nutritious breakfast wrap to kickstart your morning with! I created a grilled halloumi wrap for me and my non-gluten free boyfriend and he really enjoyed the taste,texture and thickness of the wrap more than other gluten free wraps that we’ve tried in the past. Now these are pretty self explanatory. They are pre-cut in a pack of 4 and come at 100calories each. They are so so soft and light and are great for lunchboxes. They are a great alternative if you want to cut down on your bread intake, as they are so convenient with the size of them. You could toast them, roll them up, or make mini pizzas! They are very handy to have around. And they can be frozen and defrosted really easily. I LOVE making fish finger sandwiches and BLT’s with these! I think we’ve already seen the ‘crumpet challenge’ on our newsfeeds in the last year or so (if not, where have you been? 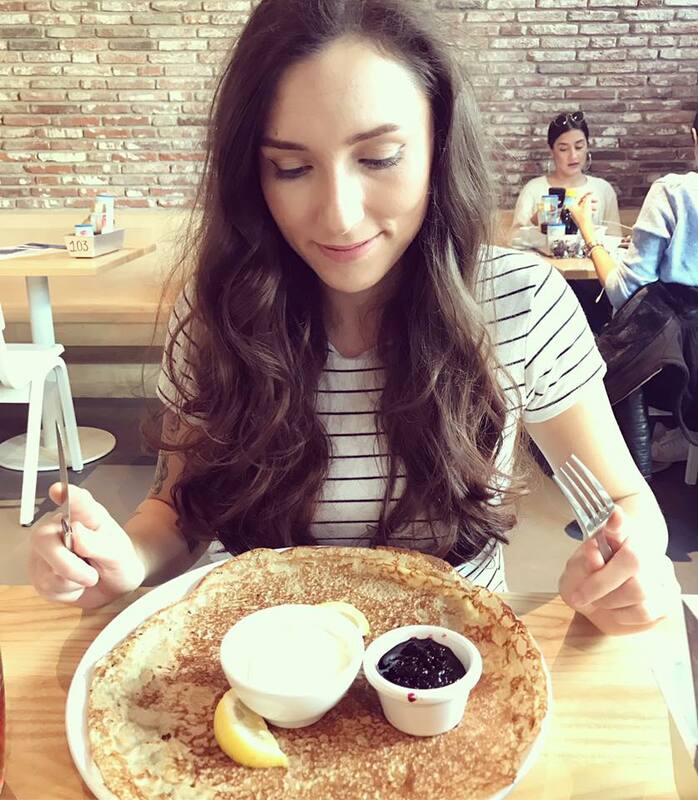 ), in which influencers tried to create their most unique crumpet toppings with the then ‘Newburn Bakehouse’ crumpets. The recipe hasn’t changed but they still have that great taste, and go well with both savoury and sweet toppings. Have you tried the range so far? Let me know your thoughts! A big thank you to Warbutons for letting me try their products. Previous Previous post: REVIEW: Isabel’s Baked Doughnut Mix. Next Next post: RECIPE: Gluten Free Creme Egg Cookies!